Despite a partially broken arm and a heavy cover of dust, the Mars Curiosity rover sent by NASA a decade ago, continues to make intriguing discoveries. Just last month when drilling rocks on the red planet’s surface it came across organic compounds, suggesting that at one time in the distant past, Mars was a hospitable place for life. Now, the rover’s latest discovery suggests the presence of salt water entrenched far beneath the surface of Mars, where the majority of its remaining water is thought to exist in its polar ice caps. In its past, the red planet was likely also home to a vast ocean, larger than the Arctic Sea, but lost much of its water due to the thinning of its atmosphere and solar wind, according to recent analysis. If this salt water, or brine, does in fact exist on the red planet, there’s only trace amounts of it. When it does occur in its liquid form, there’s hardly enough to provide potential nutrients to any living things. However, it may be of use to solving one elusive mystery on the red planet. The findings were published this week in the journal Nature Geoscience, and may account for the mysterious dark streaks known to routinely appear and vanish across the Martian slopes – something that has fueled the speculation of many UFO enthusiasts. However, this may not quite be the news they’ve been looking for. These findings in fact serve as a reminder that the presence of water outside our planet doesn’t always promise that we’ll find life. “Perhaps the statement ‘Follow the water’ as a clue, should be reexamined,” said the study’s lead author F. Javier Martin-Torres, a planetary scientist from Lulea University of Technology in Sweden, in a recent email. “Finding signs of the brines involved a little serendipity,” as Martin-Torres called it. “Well, it was not that we were looking for them,” he said. He, along with his colleague Maria-Paz Zorzano of the Centro de Astrobiologia in Spain, started the project out of what seemed like routine mapping of Curiosity’s data. They drew a plot of Martian temperatures and conditions of relative humidity with the help of the Rover Environmental Monitoring Station instrument before they came to realize that, provided with the right conditions, Mars could hold a thin skin of perchlorate-filled water just below its surface. “We realized that we were seeing conditions where brines should be formed. Since then, we have been studying the process in collaboration with other [Curiosity] team members,” said Martin-Torres. The scientists think that rather than the norm, these brines are actually an unusual phenomenon that occurs on the planet – likely happening on only a few nights each year when Mars’ relative humidity happens to be very high and contrasts with the very low temperatures that Mars is known for. At that point, the small pools of brine lie just beneath the surface, mixing in the top layer of soil. Once the sun rises, starting a day that is 2.7 percent longer than those on Earth, the pools quickly shrivel up and dry out. Perhaps future rover missions may be able to capture such a phenomenon when it does take place. So how does it happen? The brines is created by perchlorates, which can be found all throughout the red planet. They are composed of a single chlorine atom, joined by four oxygen atoms, and two of their properties make them perfect for capturing liquid water. Like table salt, perchlorates reduce the freezing temperature of water, which allow it to remain a liquid even in glacial climates. But there’s something more interesting to them that makes their name worth remembering. They are able to draw water molecules out from the air, bringing them to a liquid state. The entire process is known as deliquesence. “It’s a dual property of the perchlorates that they can absorb large amounts of water vapor and they can release it in a way that forms a liquid — with the salt acting like an antifreeze,” said the study’s co-author Ashwin Vasavada, Curiosity’s project scientist at the Jet Propulsion Laboratory, in an interview with the Los Angeles Times. Unfortunately, while perchlorates permit the water to keep its liquid form when near the planet’s surface, they also would suffocate any microbes that would use the water. “If you were able to sample these little films of water, they would have so much salt dissolved in them that it would be impossible for life to use that water,” Vasavada said. Martin-Torres supported his statements. Brines strong enough could destabilize the metabolism of microbes and reduce the places in which they could reproduce. Remember why drinking sea water is never considered a good idea? The Curiosity is not equipped with the tools for sampling brines, should they exist, but this could be something for future Mars missions to consider. NASA hopes to send a manned mission to the red planet by 2039, but has a rover mission in the works for the 2020s. Whether or not they exist, the possibility that these brines may be able to appear within the Gale Crater landmark suggests to scientists that they are both more likely to exist – and to withstand longer durations of time – in much colder regions of Mars, that are nearer to the poles. 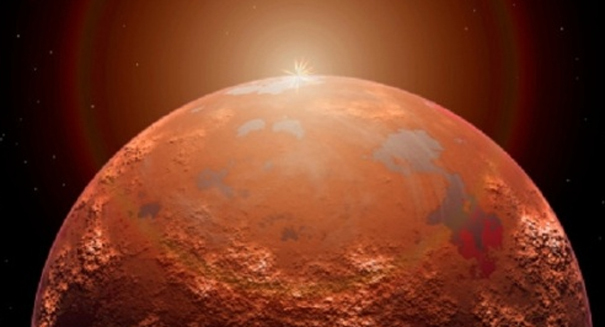 Although the brines show no astrobiological potential, they might offer some explanation of dark flows on the Martian surface, according to Vasavada. Unusual, flowing dark bands have been sighted on Martian mountains by NASA’s Reconnaissance Orbiter. These lines could in fact be the result of brines that rise all the way up to the surface – an explanation supported by the lower temperatures existing higher up in the Martian atmosphere.